In the midst of their biggest ever tour – “Dada Land” – Dada Life recently revealed their new album, ‘The Rules of Dada’, which will be released on October 16 in North America. 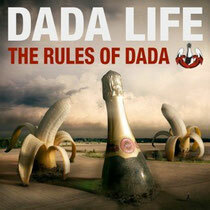 It features a combination of Dada Life’s recent singles – ‘Kick Out The Epic Motherf**ker’, ‘Happy Violence’, ‘Rolling Stones T-Shirt’ and ‘Feed The Dada’ – and future tracks like ‘Boing Clash Boom’, ‘So Young So High’ and ‘Arrive Beautiful Leave Ugly among others. Dada Life is in the midst of “Dada Land,” their largest ever tour. Running for seven weeks through the beginning of November, Dada Life and their army of Dada’s Little Helpers will take over cities big and small from Canada’s great white north and American college campuses to the bright lights of Las Vegas.